I flew out of Guatemala City in October 2008 after two months of intense Spanish study and adventurous traveling in Central America. As we lifted off the tarmac, I thought, “Well, that was fun. I probably will never come here again” — and by “here” I meant, partly, the country of Guatemala (so many countries in this world! so little time! ), but mostly I meant the city. “Guate Ciudad” is not a great place. It’s a Central American capital, which means it’s chaotic, dirty and dangerous. My Spanish teacher in Xela explained repeatedly that it was full of ladrones who would murder me (which seemed like hyperbole until I read this article in the New Yorker), and even the Lonely Planet couldn’t muster much enthusiasm. But here I go: off to Guatemala City for a long weekend! Woot! The flight was packed with teenagers — probably a quarter of the plane was under 18. Mostly a large school group but also a handful of families with kids. As we waited at the gate, I was mesmerized by the school group. The closest analogy I can draw is to a swarm of gnats: Constant motion, a buzz of noise, obliviously self-contained, a little annoying to walk through but otherwise completely harmless. And I really mean that last part to be a compliment: Yes, the crowd of boys (they were all boys) was large and very social, but they were also collectively very well-behaved. I observed them for about half an hour and saw none of the horsing around that I’d initially expected. We started boarding in groups and, by the time we’d gotten to Group 3 it was clear that the big group of boys was in Group 4 — because they were all waiting in a clump reminding each other that they weren’t supposed to go until Group 4 was called. I was toward the end of Group 3 and was about to hand my ticket to the agent when two extremely pushy parents yanked their own three teenagers into the line, cutting right in front of me. The three kids looked at them and said, “But Mom and Dad, why are we getting in line now? We’re in Group 4 –don’t we have to wait our turn?” To which the parents responded, “No way, we’ve got to beat that” (referring smugly to the large group of boys). At that moment I loved those kids and despised their parents. Couldn’t they see that they were engaging in precisely the sort of inconsiderate, immature behavior (line-cutting, pushing) that they were trying to avoid with group of boys (who were waiting their turn)? More importantly, couldn’t they see that they were TEACHING THEIR KIDS TO BE THE SAME WAY? That they were ACTIVELY UNDOING whatever good parenting lessons or other positive socializing forces had taught their kids that courtesy and waiting one’s turn are desirable social behaviors? Gah! Bad parents! Amanda has said many times that while teenagers may look like adults, they don’t always act or think like adults. To which I say, sometimes that’s a good thing. 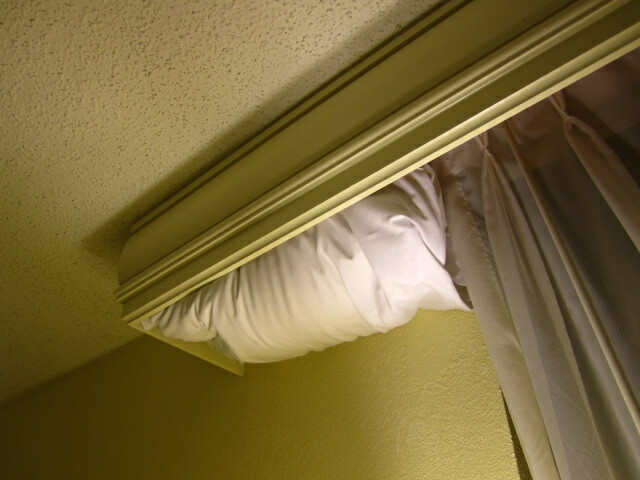 Why on earth would Marriott store pillows in the cornice over the window?